Crispijn de Passe the Elder (circa 1565-1637), Engraver, draughtsman and print publisher. Artist associated with 36 portraits. 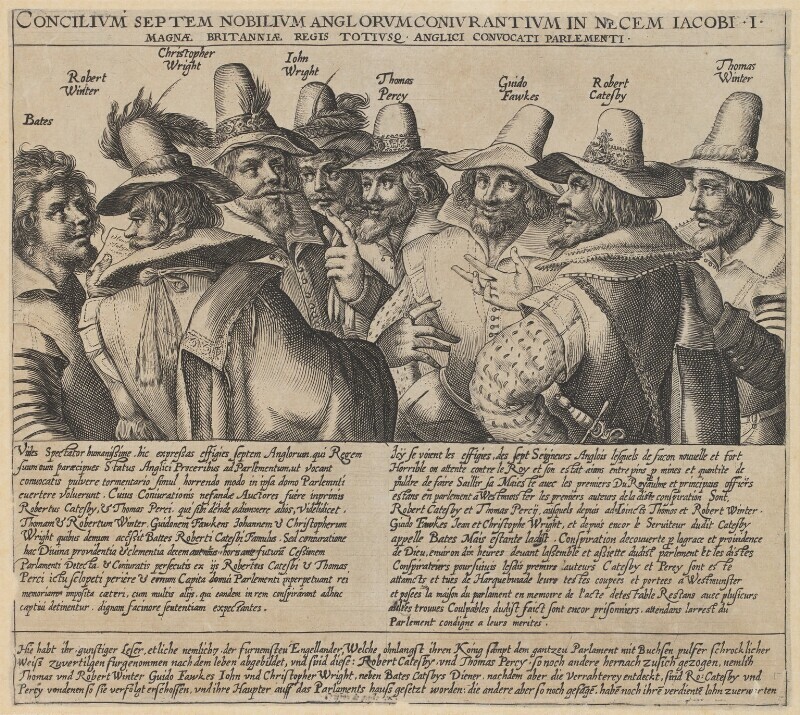 This print includes the only contemporary portrait of Guy Fawkes and other members of the plot to destroy the Houses of Parliament in 1605. The names of the conspirators are inscribed in Latin above their portraits. The text below describes the events of the plot and the fate of the conspirators. It is written in Latin, French and German, which indicates the international audience for this image. The Gunpowder Plot is foiled when Guy Fawkes is discovered with barrels of gunpowder under the House of Lords. The coup, to blow up the House at the State Opening of Parliament, thereby assassinating James I, was conceived by a group of Catholics angered by the king's repression of recusants. In the first of many collaborations with architect Inigo Jones, playwright Benjamin Jonson presents The Masque of Blackness for James I's, in which Queen Anne makes an appearance. The production secures future masque commissions for Jones and Jonson at court. Philosopher, Francis Bacon, publishes his treatise The Advancement of Learning. Spanish author Miguel de Cervantes publishes the first part of his satirically romantic novel Don Quixote. Within a matter of months, three popes would ascend the papal throne, Clement VIII, Leo XI, Paul V respectively. Many details prove it : number of hairs on Percy, of stripes on Winter. The best proof is the cape of Percy, which is partially erased in this second state.